Published: Oct. 23, 2011 at 03:00 p.m.
OAKLAND, Calif. -- It took only one half of scoreless football for Raiders coach Hue Jackson to start the Carson Palmer era. Palmer was inserted into Sunday's game against the Kansas City Chiefs with 10:25 remaining in the third quarter. 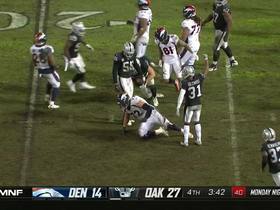 He finished 8-of-21 passing for 116 yards and no touchdowns with three interceptions in a 28-0 loss, the Raiders' first shutout defeat since the 2009 season. 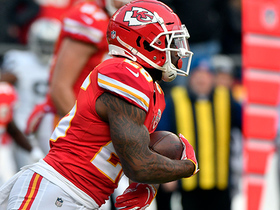 Kyle Boller started at quarterback, but his first drive featured rookie quarterback Terrelle Pryor taking a snap and Boller throwing a interception that Kendrick Lewis returned 59 yards for a Kansas City touchdown. Palmer, whom the Raiders acquired Tuesday in a trade with the Cincinnati Bengals, watched from the sideline. 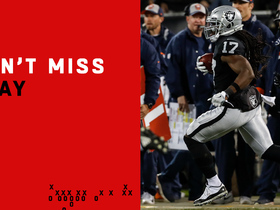 Boller opened the game with a 7-yard scramble that had the home crowd in his corner, but boos were in abundance after he threw an interception that resulted in Kansas City taking a 7-0 lead. More boos followed after Boller went three-and-out on Oakland's next series. Boller threw another interception on the following series, leading the crowd to chant, "Palmer, Palmer." Boller threw yet another interception later in the first and went three-and-out in his only second-half series. He finished the game 7-of-14 passing for 61 yards with the three interceptions. The Raiders acquired Palmer for a 2012 first-round draft pick and a 2013 conditional first-rounder after then-starting quarterback Jason Campbell broke his collarbone during a Week 6 victory over the Cleveland Browns. It was widely speculated that Palmer would start against the Chiefs, despite not throwing an NFL pass since the 2010 season, but a league source and multiple Raiders players indicated Friday that Boller likely would start. 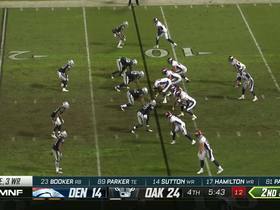 Boller's familiarity with the Raiders' personnel and coach Hue Jackson's system played a large role in the team's decision to hand him the ball. As for Pryor, the rookie from Ohio State lined up at wide receiver on a third-and-1 play Sunday, went in motion, stopped behind the center, took the snap and plunged into the line of scrimmage. The play was negated by a penalty, though, because officials ruled Pryor didn't pause long enough under center.